Islamabad (Agenzia Fides) - The Supreme Court of Pakistan has restored the value and the civil effects of Christian marriage. The Court ordered the "National Database and Registration Authority" (NADRA) of Pakistan and the Punjab government to reactivate the official registration of marriages celebrated in churches by Christian citizens. The decision was welcomed by Christians in Pakistan. "This marriage registration provision existed before 2013", says to Fides Kashif Aslam, coordinator of the program of the National Commission for Justice and Peace (NCJP. And adds: "Local governments had suspended it, along with a package of other measures, but now the Supreme Court has restored it. The registration of Christian marriages will help to complete the data of marriages in Christian communities". The order of the Supreme Court is the result of the appeal presented by Pastor Shahid P. Meraj, dean of the Anglican Cathedral Church of the Resurrection in Lahore. 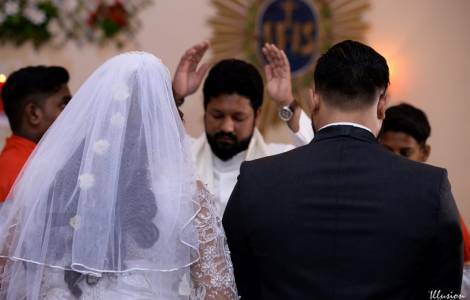 "The lawsuit began in 2018, because the fact that marriages celebrated by Christians had no legal and civil value was considered serious", Pastor Shahid Meraj told Fides. Anglican Bishop Alexander John Malik, at the head of the "Church of Pakistan" (Anglican) in Lahore, said during the trial: "According to the Christian Marriage Act of 1872, marriages celebrated in the Church, once completed the register of marriages, are transmitted to the General Chancellery of Births, Deaths and Marriages. This process went on for many years without any problems, however, once the Union Councils on a provincial basis were established, births, deaths and marriages records are transmitted to the Councils of Union, which started, however, not to register Christian marriages any more". "It is a very good move by the Supreme Court, but it will take a long time to sort everything out", comments Fr. Mario Rodrigues, Rector of the St. Patrick's Cathedral in Karachi.